Tangled Wedding Cake Decor, a beautiful combination of cakes that you could decorate for yourself,friends,cousin,sister,brother weddings or for even wedding anniversaries. Thais game has characteristics like, change the cake design, top design buttons,color of the cake,add on wedding cartoon of the couple on top, juice,table color, knife color and few extra features added. you can try different cake combination and press show then you save the photo of final cake decoration if needed. 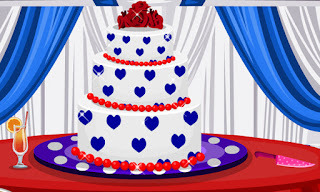 This would be a fabulous cake decor for everyone to enjoy fun decorating wedding cake from ajazgames.